Structural Framework for the Trailer is Complete! R&R Construction Services’ sister company – R&R Rigs has finished Phase 1, the most important phase of building this custom cooking trailer. The structural framework of the Boiler/Grilling Trailer is the most important part because it is the “tree” upon which the rest of the parts of the trailer are “hung.” The structural framework for this 20′ trailer consists of 5 steel roof trusses that are individually fabricated by cutting 20′ pieces of 2″ steel into specifically measure lengths. Small strut supports are also cut to create a triangular frame – similar to the wooden frame of a roof truss for a new home – for each of the 5 trusses. Once all of the pieces are measured 3 times and cut once, the 8 pieces are welded together for each of the 5 trusses. This measuring, cutting, fabricating, and welding process is very precise work. If even one of the trusses is off by even 1/8″, the entire framework of the trailer could be completely skewed, and the trailer framework could end up being up to 1.5″ off from one end of the trailer to the other. Why is this important? Well, if you have ever worked with cutting and welding metal, there is absolutely no room for error in your measurements, cuts, and welds. Unlike wood that you can bang with a hammer and “meld” it into shape if it is just the slightest bit off, metal is unforgiving in its structure. Once a piece of metal is welded into place, and you notice that there has been a mistake in the measurement or placement; you have to cut it apart and re-weld it to correct this mistake. Therefore, there are many man hours put into fabricating just the roof trusses. Once all roof truss pieces have been welded together to create the triangular structures that are going to hold the “walls” of the trailer, the roof of the trailer and all of the components inside the trailer including the boiler pot firewall, the sidewalls of the grills and smoker, the back drop table, the control panel and sink area, and the propane tank and storage box area; then the outside steel supports are welded into place. Because every trailer purchased has a different “floorplan layout” that defines where the tires and tire wells are placed, how and where the tongue of the trailer is in relation to the tires and many other factors, placement of the roof trusses also has to be carefully designed so that the support that this structure provides is balanced on all sides of the trailer. Each roof truss is erected one at a time and firmly welded into place. The outside steel supports for the roof truss go in-between each roof truss on both sides of the trailer. These supports are the first part of the framework that is essential to supporting the galvanized metal roofing, as well as the 2, 24′ I-beams that will extend out of both the front and back of the trailer. This support is critical because the electric hoists that will be installed on trolleys on the 2 I-beams will be lifting and transporting 100’s of pounds of food, so these steel supports are designed to tie the entire roof truss system together. The next part of the roofing and structural support system to go on are the 2, 24′ I-Beams. Because of the bulkiness and awkwardness of handling a 24′ steel I-beam, great care is taken in mounting the I-beams approximately 12′ off of the ground and at least 10′ off of the trailer. Once the I-beams are in place, they are then welded precisely into place. Many different types of levels are used to ensure that the I-beam is placed in an exact straight line, so that the hoists will move directly down the cooking line to the drop table or straight out of the front of the trailer to lift out the propane tanks for refills or maintenance. The I-beams will also help with a weight balance for the trailer as it rides down the road. Now that the roof trusses have been measured, cut, fabricated, erected, supported and the I-beams have been installed, the next part of the structural frame to be fabricated are the steel angle supports that go from truss to truss providing a top support to the roof. These steel angle pieces are also meticulously measured and cut. Upon completion R&R Rigs will have 4 sets of steel angle that will be welded evenly down the slope of the roof trusses from the peak of the roof. Just like when you build a home and you install plywood over the rafters to provide a full support underneath the roof; these pieces of steel angle act as that secondary roof support for not only the roof itself but to tie the entire truss system together, and to make the structure immovable while the trailer is traveling down the road. Once all of the steel angle has been installed, then the galvanized metal roof itself is screwed to the steel frame. This roof has to be “wind resistant” and stay in place even during travel, so the roof itself requires many screws to ensure that it will stay in place. This Boiler/Grilling Trailer is now ready for Phase 2 of construction – most of Week 2 will be spent cutting aluminum and fabricating the boiling pots, the boiling pot firewalls, and the grilling area. Visit us next week to get an update of this construction progress. To find out more about ordering a custom cooking trailer from R&R Rigs, Contact Us Directly at 985-246-4591 or Info@RandRCS.com. Well, after many, many measurements, evaluations, and discussions with the original trailer company and new trailer companies, it was decided that the trailer originally purchased by R&R Rigs to create the Boiler/Grilling Trailer for the Gulf of Mexico Deepwater Horizon Oil Spill would not have the structural integrity that Rick was looking for in a trailer. After visiting a trailer company last Friday night, Rick decided to swap out the original trailer for a new trailer that did not have the roll bar around the sides of the entire trailer. Because of the Boiler/Grilling Trailer’s design, Rick would have had to cut the roll bar in several places, and he was concerned that doing this would weaken the structure and balance of the trailer. In searching for a 20′ trailer that did not have the roll bar design, Rick was pleasantly surprised to find the product he was looking for, for the same price, but that far exceeded the original trailer in quality and durability. Not only would the new trailer have a similar design as the first Disaster Relief Boiling Rigs that were built by R&R Construction Service, BUT the new trailer is also 10 times the original trailer because it has a stronger steel structural frame, 6, 10-ply heavy duty trailer tires with sidewalls, and 2 rear outriggers. The new trailer was delivered to the R&R Rigs’ warehouse on Monday, and Rick and his welder immediately went to work cutting the steel pieces that would be welded to create the steel structural trusses for the roof of the trailer. This steel frame also will support the 2, 24′ I-beams that will be used to support the electrical hoists. The electrical hoists will be able to transport the boiling pots’ food baskets up and down the cooking line, delivering food to the drop table at the rear of the trailer. On the side of the Boiler/Grilling Trailer that has the 2 grills and smoker, the electrical hoist on that side will transport a custom-made meat rack. 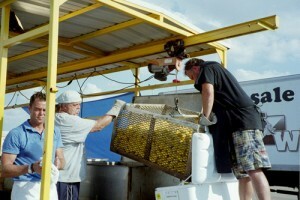 The meat rack will contain aluminum sheets that can be pulled out to dump the meat on the drop table. In addition to the meat rack and cooking baskets, the electrical hoists will also be used to lift the propane tanks off of the front of the trailer so that they can be refilled. So, the steel frame and I-beam configuration is basically the framework that will support the weight of the trailer operations. On Tuesday, the structural trusses were put together “on the floor” to make sure that all of the parts of the trusses go together and are perfectly straight and level. 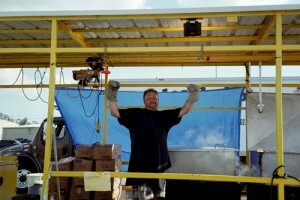 Then, today, Rick started erecting the trusses on the Boiler/Grilling Trailer itself. The erection of the trusses also is a very exact procedure in that they must be absolutely level with the trailer and with each other. Tomorrow (Thursday), R&R Rigs will erect the rest of the structural trusses, weld the 2, 24′ I-Beams to the steel frame, and install the galvanized metal roofing panels. This Boiler/Grilling Rig will be ready to be painted with heat resistant paint by Friday. Stay tuned to see the completed steel structural frame and roof of our trailer. 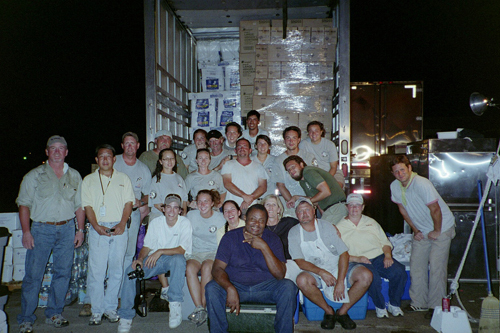 Beaumont, TX, was the site of the emergency relief site that was set up to help out local residents and workers that had been devastated by Hurricane Ike. 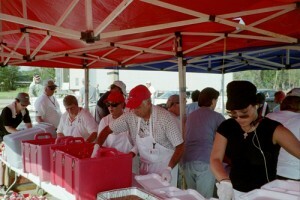 Rick Daniels joined the catering company LA Grill in assisting with the set up, take down, and running of the cooking site at their location in the middle of a Bingo hall parking lot. With no water, electricity, propane, or gas, Rick was the project manager in charge of material acquisition, site maintenance and clean-up, and equipment maintenance. 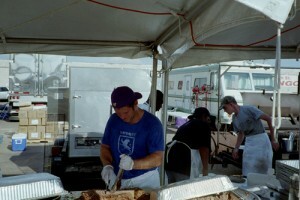 Rick was also in charge of keeping the site’s busy crew performing tasks throughout the day that would provide clean cooking pots and pans, enough propane for the burners, and enough gas in the generators to cook up to 10,000 meals a day at lunch and dinner. Click Here to View the Slideshow! 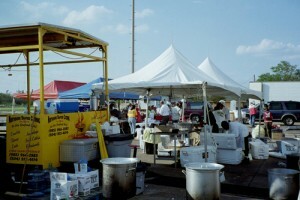 This cooking/catering operation utilized a large cooking trailer and many portable pots for cooking hot meals. The food arrived on refrigerated semi’s that parked around the cooking site and kept the food cold until it was ready to be served. Food was packaged in bags, and the bags were placed in boiling pots and then boiled until they reached the right temperature to be served. Then the bagged food was transported via an electric hoist to the end of the cooking line and dumped out on a drop table. 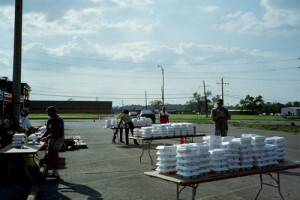 The food was then put into cambros to keep the food hot until it could be served to local residents and disaster relief workers in clam shells (styrofoam containers). 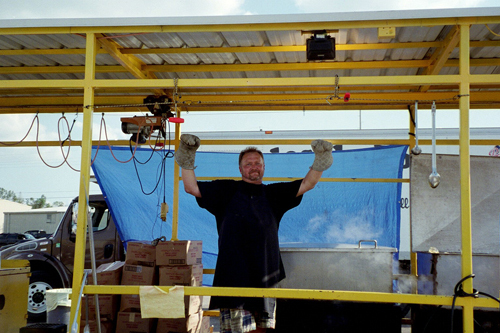 While running the site, maintenancing the equipment, acquiring propane, gasoline, and other materials for the cooking/catering site, Rick had his eye on the cooking trailer that was used to boil the bagged food. Because he is always looking to improve systems and structures to make them more efficient and durable, he came back from Beaumont, TX, with an idea for a cooking trailer that would cook more food, cook the food faster, and be made out of trailer material that would be more durable. He got his chance to “build his theory” when he was contracted by an international company to build his boiling unit. The first unit he built had 4 large boiling pots and a smaller boiling pot that could be used to boil rice. The boiling pots had the capability to cook 100 cases of food an hour, easily cooking food for up to 10,000 people a day. The boiling pot system was specially designed with a double-walled pot system to bring the water to a boil quickly and then hold that temperature throughout the cooking process, efficiently using the 2, 100-gallon propane tanks so that they did not have to be refilled as often. Rick installed 2 electric hoists on the trailer so that both cooking lines could cook and deliver food at the same time. 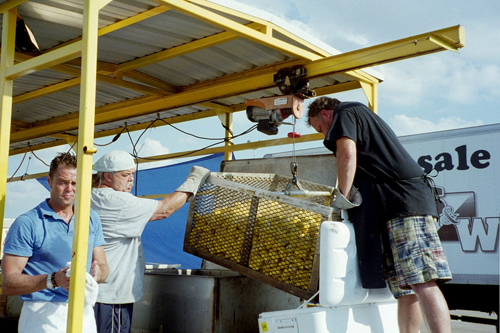 The most important aspect of this trailer is that it can “stand alone” at the emergency relief site with an onboard generator, an onboard water tank with a water pump, sink, and reservoir tank, an onboard gasoline tank, 2, 100-gallon propane tanks, and an electrical system that can either work off of the generator or work off of shore power (once the electricity is restored). So, this trailer would be able to go into a totally devastated area (like Beaumont, TX, after Hurricane Ike), set up with water, electricity, gas, and propane, and cook food for people until destroyed utilities could be restored. 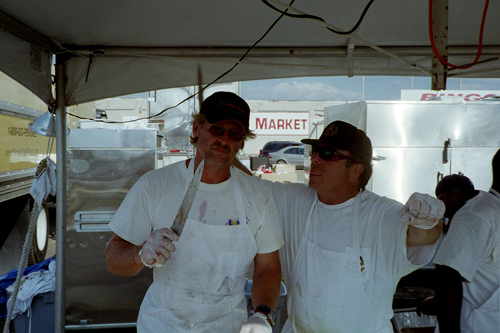 Upon completion of Rick Daniels’ invention of a disaster relief boiling trailer, the goal became to design and build custom cooking trailers as well as offer repair and maintenance services for existing cooking trailers. He accomplished that goal by restoring, maintenancing, and cleaning 3 cooking trailers and 2 smokers after his return from Beaumont, TX. Rick also completely renovated a 28′ mobile kitchen for the same international company for which he built his first Disaster Relief Boiling Unit. Rick Daniels with R&R Construction Services’ sister company – R&R Rigs – is now in the process of building another disaster relief cooking trailer for North America’s largest environmental services company. This company is handling parts of the Deepwater Horizon oil spill clean-up and waste disposal and will be using the cooking trailer to feed approximately 2,500 employees. Stay tuned to this blog to follow the construction of R&R Construction Services’ newest cooking/catering trailer project. Contact R&R Construction Services for All of Your Repairs, Remodels, Renovations, & Additions! Call 985-246-4591 or E-mail Info@RandRCS.com!